Leaked information about Samsung's next flagship phone, the Galaxy S5, continuously circulating lately. The latest news shows a photo allegedly a picture of the packaging device. Quoted from the leaked photos to GSMArena, it seems some of the detail specifications of the Galaxy S5. 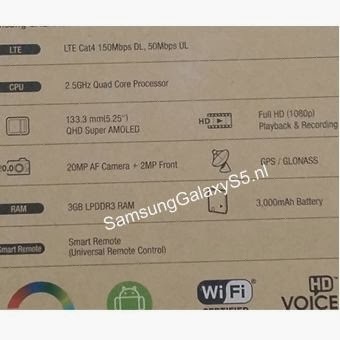 According to the observations KompasTekno, leaked specs in the picture is in line with growing rumors before. Based on this photo, it appears that the network supports LTE Galaxy S5 Cat 4 2.5 GHz processor and quad-core processors. Allegedly, the processor dibesut by Qualcomm Snapdragon and has the names of 800 8974AC series with a clock-speed of 2.46 GHz. Rumor, rumored Galaxy S5 comes in two versions. The first version uses a Samsung processor, the Exynos 5430. The second version will come with a Qualcomm processor. Other information shows, the Galaxy S5 will use a screen size of 5.25 inches with qHD resolution of 2,560 x 1,600 pixels. Type of screen is Super AMOLED. Meanwhile, there are two cameras that are prepared by the South Korean company. The front camera has a 2 megapixel image sensor. At the rear there is a 20 megapixel camera. Other specification information is 3 GB of RAM and a battery of 3,000 mAh. This device runs on the Android 4.4 operating system KitKat. Just for the record, there is still a possibility this is a leaked photo edits. To know the exact specs, just wait for the official launch of the device in the event unpacked 5, next February 24 in Barcelona, ​​Spain.